The famous supermodel Amber Chia has visited Kwangdong Korean medicine hospital to experience the best spa treatment in Seoul. Amber Chia received Steamed herb pack for the whole body with cool stone on the face and shoulder therapeutic massage. 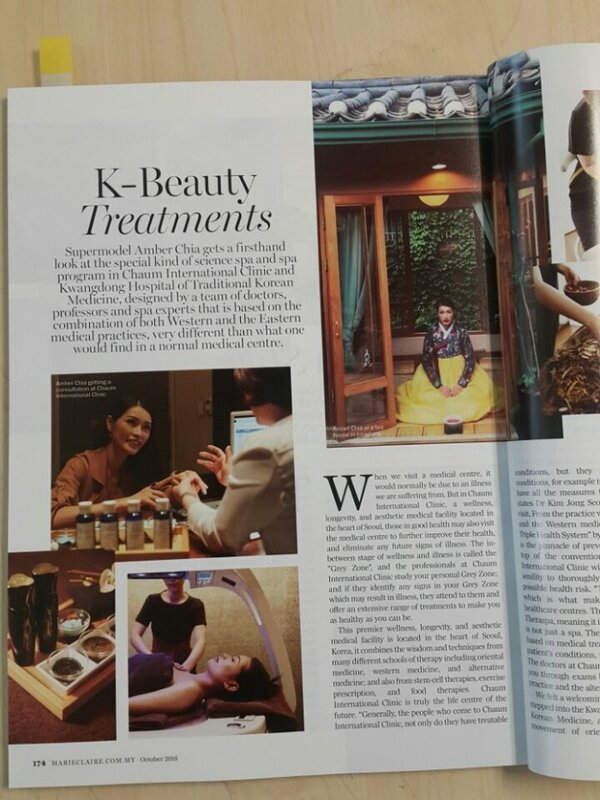 And Amber Chia's experience in Kwangdong Korean Medicine Hospital is introduced in Marie Claire Magazine in Malaysia. Supermodel Amber Chia gets a firsthand look at the special kind of science spa and spa program in Kwangdong hospital of traditional korean medicine, designed by team of doctors, professors and spa experts that is based on the combination of both Western and the Eastern medical practices, very different than what one would find in a normal medical centre. When we visit a medical centre, it would normally be due to an illness we are suffering from. But in Kwangdong hospital of traditional korean medicine, a wellness, longevity, and aesthetic medical facility located in the heart of Seoul, those in good health may also visit the medicial centre to further improve their health, and eliminate any future signs of illness. We felt a welcoming wave sweeping over us as we stepped into the Kwangdong hospital of traditional korean medicine, a hospital set up by scientific movement of oriental medicine. The hospital opened its doors in 1994 as a subsidiary of Kwangdong Pharmaceutical Co., Ltd, one of the biggest korean pharmaceutical companies. To meet its patient's health and wellness needs, a holistic, patient oriented approach is used by its doctors, and they practice both western and eastern approach when it comes to treating their patients. "Our hospital boasts 21 years of tradition with combining both traditional oriental medical and western medical." Dr.Choi Woo Jeong tells us. This is due to the accurate readings and diagnosis mad via the western medicine which effectively addresses a wide range of health issues, whilst traditional korean medicine strengthens and awakens the natural healing forces within. The treatment programs are different for every patient, and are designed to suit each individual person. But if the patient seeks for improvement of overall health condition, preventive care of to enhance their outer appearance, Kwangdong hospital will bring our just the right package and standardised treatment program to suit. "Our hospital has a merit of combination with oriental medicine and western medical so it means we don't only cure infection on the outside or pain, but we also cure patients having problems psycholosically and consider patients with particular constitutional problem so that the body maintains its health reduces pain and recovers back the beauty." States Dr.Choi Woo Jeong. "Also, we have a good system in order to prevent diseases in the future by radical reformation."